I must admit, when I was asked to review the 66th Annual Spiva Membership Show having never really familiarized myself with the work that is happening in the area, I was a bit hesitant to agree to it. The first image that came to me when I thought of a show displaying the work of mostly Joplin-area artists was a gallery full of Thomas Hart Benton knock-offs and a collection of less-than-inspired ceramic pieces that all generally played by the rules of modern convention and followed the idea that art should just be pretty landscapes and paintings of pretty people. But, now having visited the exhibit, I must say that I feel rather guilty for ever having a sense of such doubt and elitist cynicism of the show. The show was anything but uninspired. There happened to be a vast expanse of styles, media, and content to be enjoyed and I ended up spending more time with my nose almost touching the works before, admittedly, tripping over my own feet a few times as I backed up to view the creations as a whole. I was truly amazed by the incredible amount of minutia that had been injected into these pieces by artists who obviously poured themselves into every pencil and brush stroke as much as they invested themselves into the content and meanings of their work. But, as much as I marveled at the individual pieces, I don’t think they would have been nearly as impactful had they not been arranged in the way they were. What made the show so great was the aforementioned variance in styles all rubbing shoulders. It was amazing to be afforded the opportunity to view these pieces that one would normally see all separated and sorted by their differences and arranged into gallery battalions to forever war against each other for the attention of viewers as one giant celebration of art, not a competition of style. Beautiful ceramics were holding hands with marvelous paintings that were hugging wondrous pencil drawings that were necking with gorgeous installation and sculpture pieces. It was so fun to just spin around and turn corners and take one step this way and lean my head that way to be in a totally different world of art. And that’s what the show is really about, community. It’s not about trying to say that my charcoal piece is better than your acrylic still-life that is better than his non-representation conceptual work. It’s about celebrating the joy of creating and sharing art in this area. I think more important than anything else in the show is the word “membership”. I don’t think it was ever intended to say that it is an exclusivist show. I think it was intended to encompass the membership that we all share as artists in the worlds of creativity and expression as well as the membership we all claim in being part of this region and the art that comes out of it. And that’s exactly what comes through in this show. The pure expression, emotion, and freedom that art allows us to make for ourselves, but also to share it with others, free of the worry of category and genre and movement. The category, genre, and movement is art, and shows like this are truly the spearhead of such an important collectivist love of all things expressive. 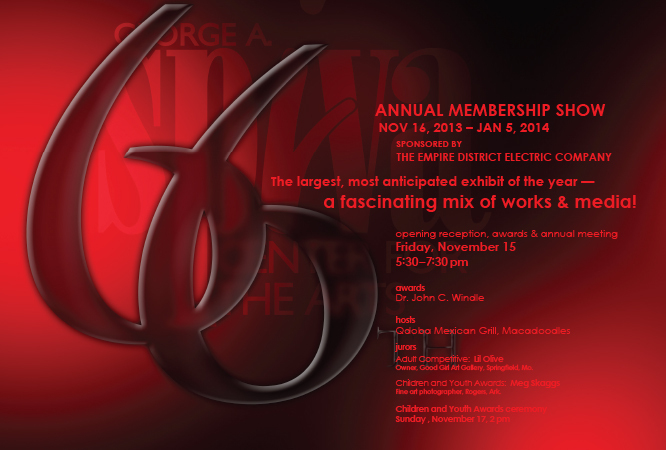 Show sponsored by Empire District Electric Company and runs November 16, 2013-January 5, 2014. In December, I spent some quiet time in the Regional Gallery of Spiva Center for the Arts. 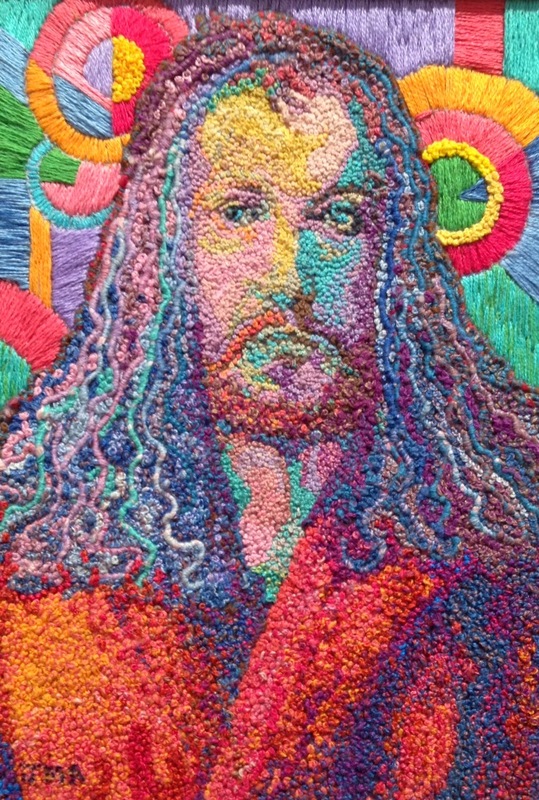 The show was Four Women / Four Visions – Contemporary Fiber. Each artist is from Oklahoma, has a distinctive sensibility, but as a whole, the works talk to each other in this intimate but strangely vast gallery space. I went seeking respite, to connect with some art, to look hard, and try to wake my drawing hand from a too-long slumber. I was immediately grabbed by this series of small works by Julie Marks Blackstone of Shawnee, Oklahoma. The color screamed, of course, but my recognition of art historical references cleverly juxtaposed is what kept me there, only reading the signage after I tried to make my own connections. I giggled and even guffawed with delight at her cleverness. This series made me wish that I had Artist Card packs as a kid, complete with a flat sheet of tasteless bubblegum. I avidly collected the Topps baseball cards, why not Artist Cards? 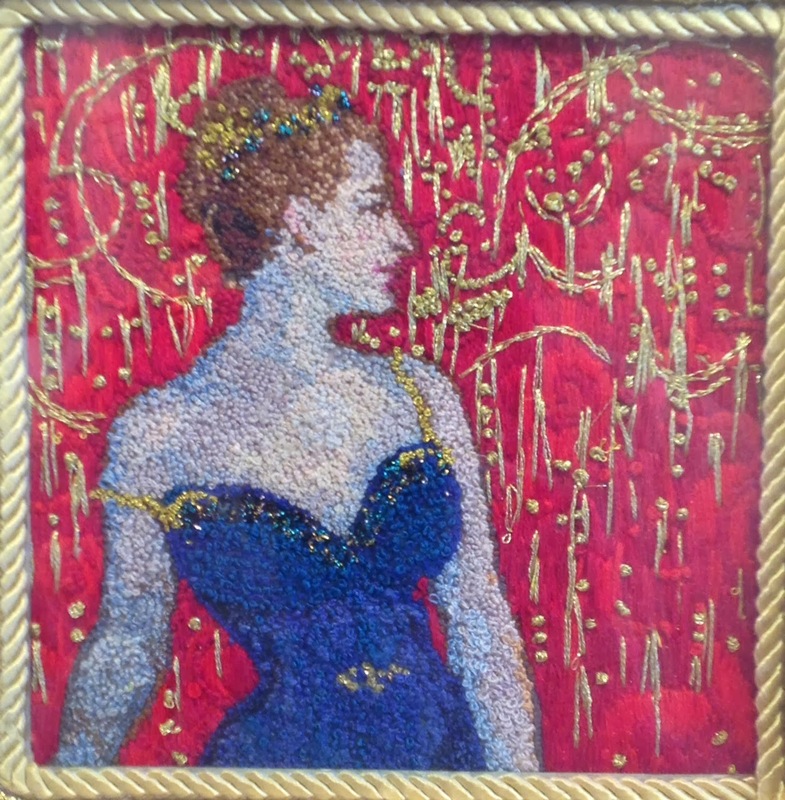 I have no idea how time-consuming and/or difficult French knots may be, but as an artist who enjoys making highly crafted pieces that take hours, I was in love with her obsessiveness. I wanted to turn the pieces over and read the stats of the art history, the listing of colors and lines and values. The Smile? Because I’m a Knotty Girl! To really spend time with the show, to get back to drawing, a much slower medium than my smartphone, I sat and observed. 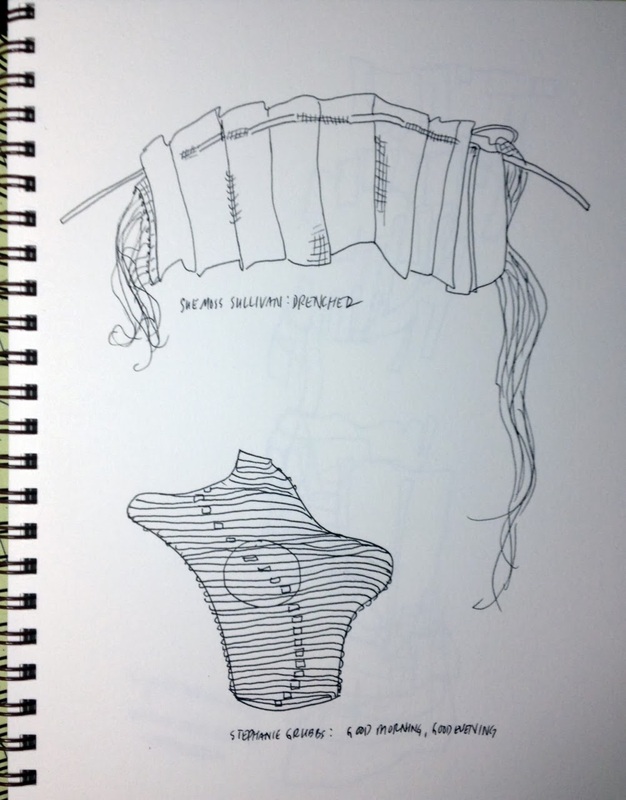 So many pieces in the show were luscious and curvy and begged to be studied carefully, but I settled on these two for quick contour ink drawings: Sue Moss Sullivan’s Drenched, and Stephanie Grubbs’s Good Morning, Good Evening. The unrelenting repetition, the variation in thread texture, and the often subtle coloring on these pieces sparked my interest. It felt divine to drag the pen across the paper. It’s been much too long. 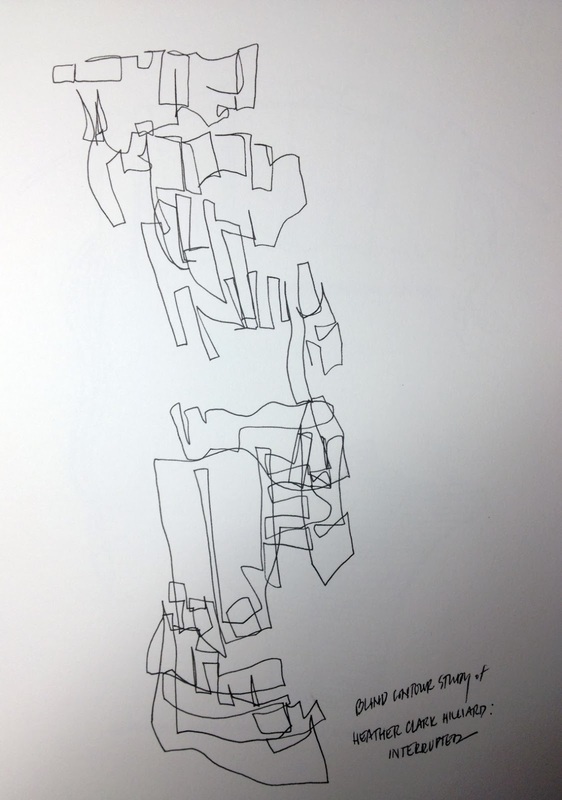 I tried my hand at a blind contour drawing of Heather Clark Hilliard’s Interrupted. I should have drawn at least three more blind contours. This is a drawing technique where you stare at the piece being drawn, but never look at your drawing as you make it, even in peripheral vision. It makes the direct connection between eye and hand, and takes away the Judge that often kills my work before it even starts. It’s loose, but takes concentration or you’ll lose your place, in which case you don’t look at your drawing, you just pick a spot and continue drawing. 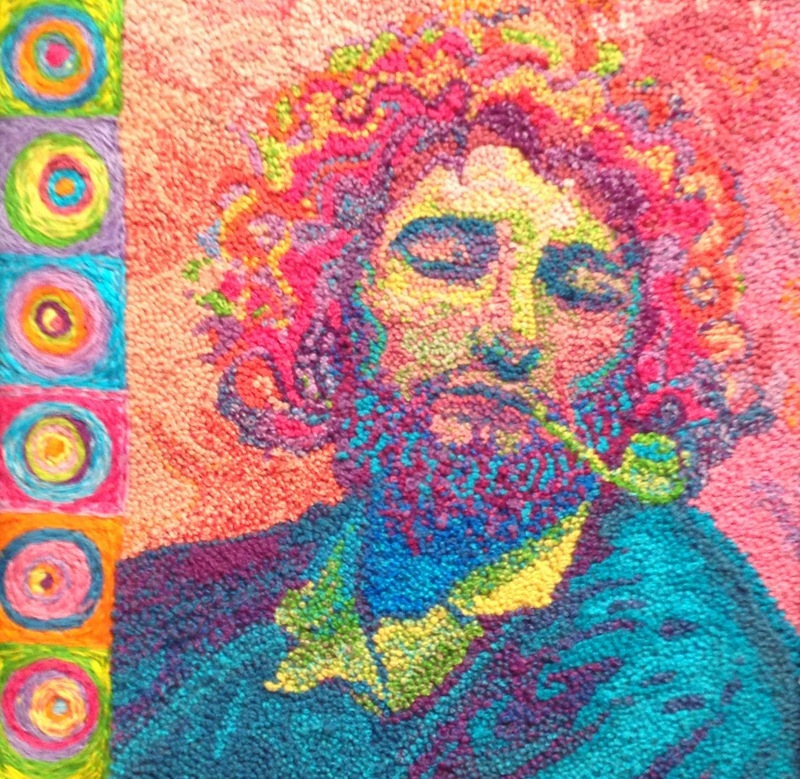 Hilliard’s piece was six-foot cut felt pieces tacked to the wall, hung heavily. I want to return before it comes down. A dark, dreary winter is the perfect time to make drawings and revel in these fragile threads. 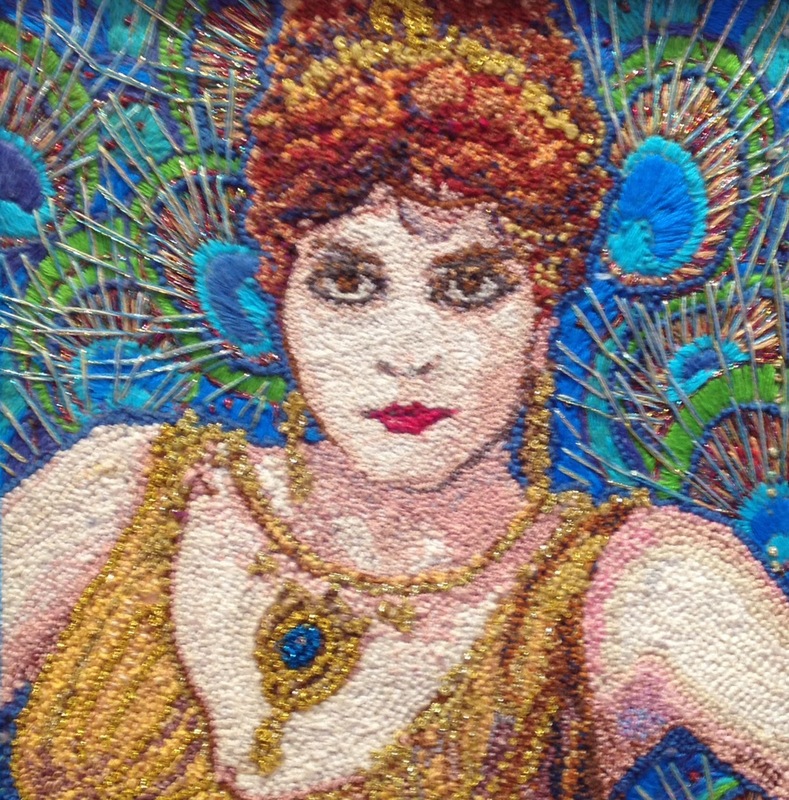 Just like those individual threads create insanely strong pieces, these four fiber artists – Julie Marks Blackstone, Stephanie Grubbs, Heather Clark Hilliard, and Sue Moss Sullivan – come together to create a vast tapestry of talent, elegance and wonder. This show is sponsored by Nancy G. Holland and Jim Stratton with additional financial assistance from the Missouri Arts Council, a state agency. TANK: Public Art (a.k.a. The TANK) is a collaborative public arts group aimed at keeping public art in the community’s consciousness as a necessary and essential facet of culture in Joplin, MO. After populating Wildcat Glades Conservation & Audubon Center with wildlife sculptures earlier this year, they have struck again, this time in downtown Joplin on the side of Spiva Center for the Arts at 3rd and Wall. Following is an interview of Taylor Kubicek, artist member of TANK by Josie Mai, Spiva Board’s Vice President. Can you tell one story about the process of making the mural, perhaps an obstacle you all overcame or a funny or surprising moment you didn’t expect? Making the mural on the Spiva building was an interesting process. On paper it seemed like a fairly simple task and overall that was true if you omit the math aspect. We didn’t project that mural but instead drew all the lines out with straight edges and tape measures. The horizontal lines are a different width than the vertical lines. Finding this magic number left all of us artistic folk scratching the right side of our heads. I’m pretty sure a group of high school or maybe even junior high students were employed to find the dimensions that would work with the existing space. That is kind of embarrassing but is what community art is really all about! How did you hear about The TANK and get involved in their work? I first heard of the Tank through my good friend Shaun Conroy. He invited me about a year ago. My first project with them was the chicken wire sculptures now installed at Wildcat Glades. What do you gain personally from creating art with a group? How does public art fit with your growth as an artist? I feel that creating art in a group environment compared to making art by myself is easier in some ways and harder in others. It is easier in the sense that you can rely on others to help problem solve and overcome logistics obstacles. It’s harder yet healthy to have to compromise. This translates to my personal work in that I am better able to question my own ideas. Public art is a great way to build confidence as an artist. It requires me as an artist to put my creations in front of the world and that can be a hard thing to do. It also keeps me civic minded and tied to the world outside. All of these things again are easier to accomplish when done in a supportive group setting. What is the importance of public art in general, and even more specifically for Joplin? In regard to Joplin and its culture, I feel, public art must expand and evolve. Joplin is still recovering from the tornado and that needs to happen but, resilience should also be discussed and defined. Is it enough for Joplin to simply rebuild or should we also focus on cultural growth? Let’s face it; the tendency has been for Joplin to bleed out all of its culture. I think it will be a fine day when people start coming to this town for its appreciation of the arts. 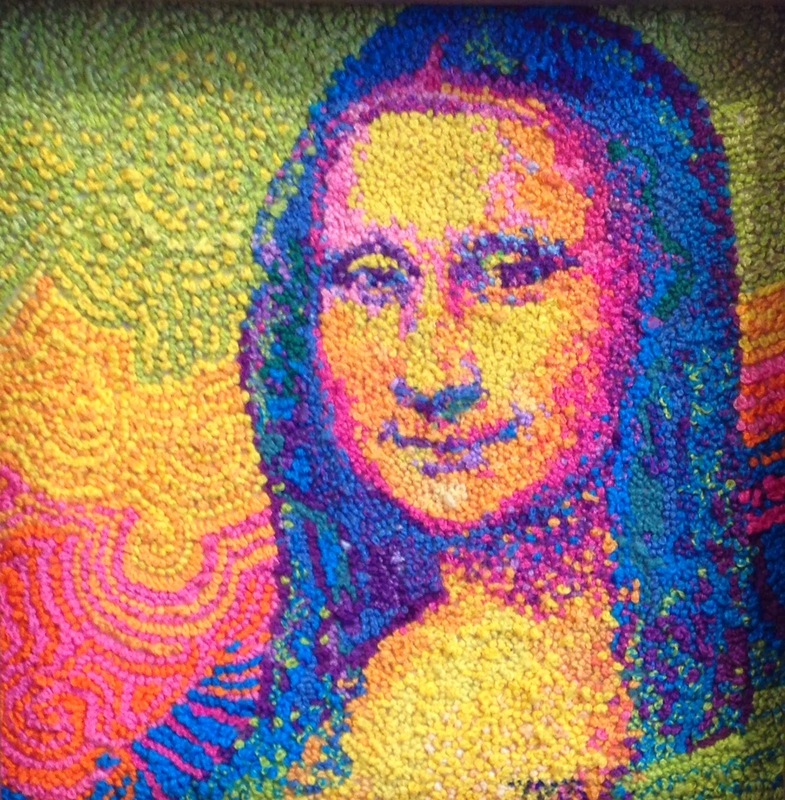 Despite the attitudes of some, I believe that everyone is an art appreciator. It connects us across all boundaries whether they are religious, political, or financial. 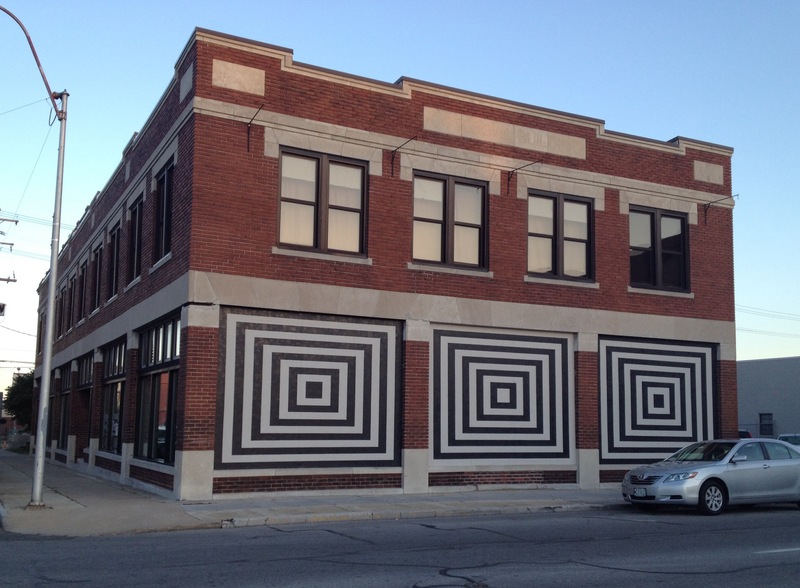 While there are plenty of murals in Joplin, our series of optical geometric murals bring something distinct to the area. Non-representational murals do more for the viewer than just portray an image; they allow the viewer to inject meaning. My hope for these murals is that they encourage others to take part in the creative process. Creating is one of the things people do best. We should celebrate that. High Country Wheat by Brenda Sageng is an oil painting on canvas, approximately 28 by 24 inches. It is a simple painting at first glance. The viewer’s perspective begins on a dirt road overlooking a fenced-in field of wheat rising into a hill. On top of the hill are a few cattle. The depth of the painting implies a very large, steep hill. Part of this is achieved by the size of the cattle, which are very tiny. Towards the bottom of the painting a barbed wire fence is shown. The painting can be separated into three main sections. Upon closer inspection to the bottom section one can see the various shades of paint used to provide a realistic portrayal of wheat. Fine brushstrokes are painted with multiple hues of oranges, greens and brown giving the wheat a wispy appearance. The texture of the paint is very delicate, and gives the wheat a very realistic representation. The detail used in painting the road, fence, and wheat in the bottom section helps provide perspective in the painting making it seem as though these objects are closer to the viewer. As the viewer looks further up the hill, in the mid-section of the painting, the color of the wheat changes to more golden shades of yellow and light orange. The paint strokes become more blended and give the wheat field a softened look. The yellows and oranges used in the painting provide a glow. On top of the hill are tiny figures, although they are not clear the viewer can easily assume that the figures are cattle. While most of the painting is monochromatic, there is a deep contrast between the warm golden shades of the wheat field meeting the clear blue sky on the horizon. In the top section of the painting, the vivid blue of the sky reflects the golden glow of the wheat field. Some of the light seen in the painting can probably be attributed to the very slight , almost undetectable, brush strokes of a lighter blue in the sky , close to the left of the horizon. Even with the lighting effects created in the painting, it is hard to tell exactly what time of day it is. Considering that the painting resembles scenes in the local area, it is possible the artist was inspired by views they had personally viewed and wanted to share the beauty of the wheat field. The painting has a simple composition, which can make it difficult to ascribe meaning to. The painting, while similar in subject to van Gogh’s Wheatfield with Crows, evokes more warmth and comfort with its color content and lack of dark shades. Sageng’s painting depicts contentment and happiness, which people tend to associate with the colors used. Maybe by using the golden tones which are also associated with wealth, she implies that the wheat field has great value aesthetically and for physical nourishment . 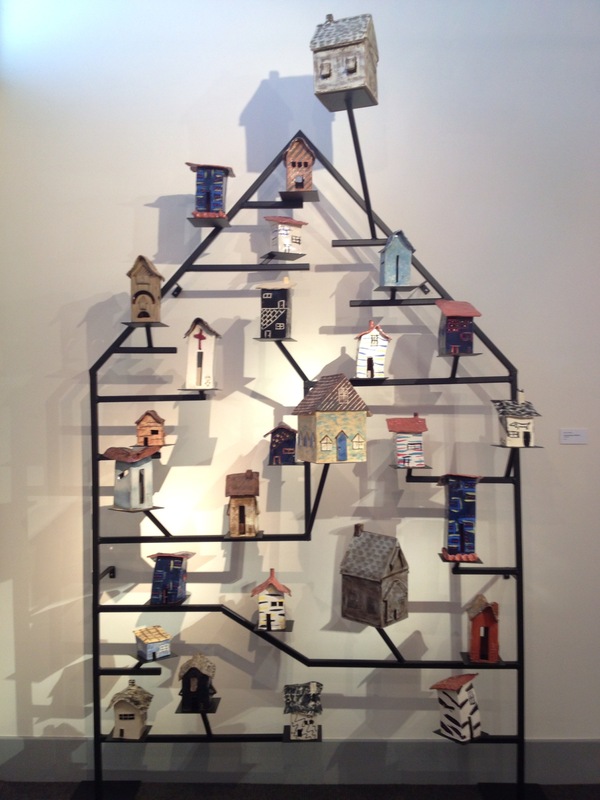 On display at Spiva as part of the Tools in Motion show is an assemblage by Armand Fernandez, aka Arman. The work is aptly titled School of Fishes. The “fishes” are actually vise-grip pliers and there are hundreds of them welded together. Positioned in a directional left to right flow, the practical usage of the tools fades into biomorphic eye candy. Light plays off of the chrome pliers mimicking a school of silvery fish. While the assemblage is nearly rectangular, the invisible edges of the piece are swollen and untamed. The soft curve of handles and plier heads overshadow the more empirical parts of the tools. Being in great number the pliers create a blanket of cold metal fishlike texture. You cannot view School of Fishes and see individual vise-grip pliers. Contrarily, the pliers must be seen as one thing. That one thing moves and breathes as each “fish” is locked in a symbiotic dance with the others. The placement of each tool creates a unified image filled with slow yet forceful flowing lines of fish. A few jot up or down nearly as random as a fishes motions can seem. Rebels. Perhaps School of Fishes is simply a fun piece and impressive only in its construction and design. But maybe this was Arman kicking in his two cents in regards to the expansion of human ingenuity. These “fish”, with exception of a few quirky strays, work with purpose and bend under one accord. And isn’t this type of pliers unusually strong for its size? These fish work as a body but function under their individual strengths. Also, rust or the absence thereof should be noted. By replicating in metal a group of animals that live in water, the sheen of the metal is relatively unspoiled by rust. Perhaps this was to simply create a silvery shine like that on a big bunch of fish. But perhaps this also is a showing of resilience. When walking away from the work the viewer is assured that the mighty fish will continue riding an invisible current. JM: What’s up with the container theme? Houses and vessels, seemingly empty containers. What is inside? What do you want the viewers to fill them in with, with their eyes? JL: I like to think of my work as extensions or evolutions of their continuous development. I would not want my art to become too literal, that it would lose the viewer’s immediate response. But you are correct, these pieces are about vessels, or cradles if you may. If they must contain an essence of the viewers response, I would like it to be hope. I believe most living creatures, human or animal, yearn to find a cradle of safety in their lives. To have something to belong in, to have something to fight for. I like my vessels to exist in environments with precarious footing, or on the verge of falling, but yet supported by a much stronger desire. My houses form mountains, they live in river edges, they dwell in the middle or at the top of trees, but hopefully they remind us of life, and that is very hopeful. JM: Now that the show has been up for a couple weeks, what would you have done differently regarding individual pieces, editing, adding more, or about the installation itself? Are there pieces you would have added or taken away? Was the installation a collaboration with Spiva, or did you both work together to install the space? JL: I wish I had made a few more pieces for this show, but isn’t this our eternal discontent? To never have done enough? Overall I am happy with the exhibit; I believe more may not have been necessarily better, but in valance I would have liked to see a big metal house on its own. Brent and I just helped with placing of some works in the gallery because of their size and weight, but the exhibit was wonderfully curated and installed by Cleo Copeland, Jo Mueller and Shaun Conroy. JM: Can you talk about the importance of presentation and display of 3D objects; is the presentation and space as important as the object? JL: I believe there is a huge difference in the use of gallery space between a two and three dimensional exhibit. A 3D piece, whether it is a wall hanging or a free standing piece, will need more space to be exhibited properly. I believe that giving an artwork the proper environment and space will greatly enhance its appeal. It is also important to note that installing a 3D show is extremely demanding for a curatorial team. And to fully appreciate a piece of sculpture, they need an environment in which the viewer can freely move around the piece. 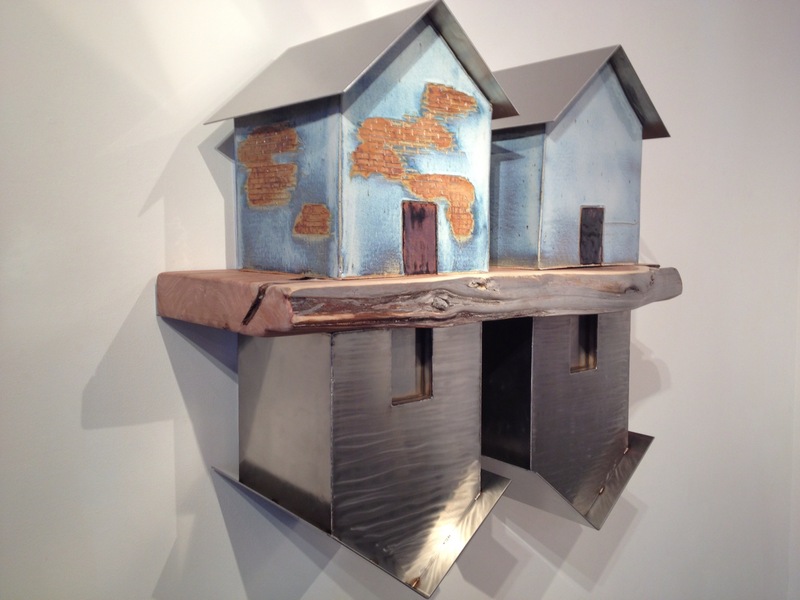 It is this need in fact, that makes some blue chip galleries use an entire room for one sculpture. So, is the presentation and display space for 3D objects important? I should say yes, it is most important, perhaps as important as the piece itself. JM: Any advice for Joplin’s young artists? JL: I would like to pass along some advice given to me by two very well-respected artists. From Nathan Oliveira, “Go to the studio and work, work, and work. Time will be your best critic.” And from Viola Frey, she told me this, “If you make a piece of art thinking of a price for it, then the art part has failed.” They not only impacted me with their advice, but encouraged me to take responsibility for what I do. My advice to a young Joplin artist is this: look for someone to believe in, and he/she will teach you to believe in yourself. Bonus advice for all artists young and old, why bounce your ideas all over your studio walls and get no response, when it is much more rewarding to bounce them off your peers and be greatly rewarded for that; it is called collaboration. 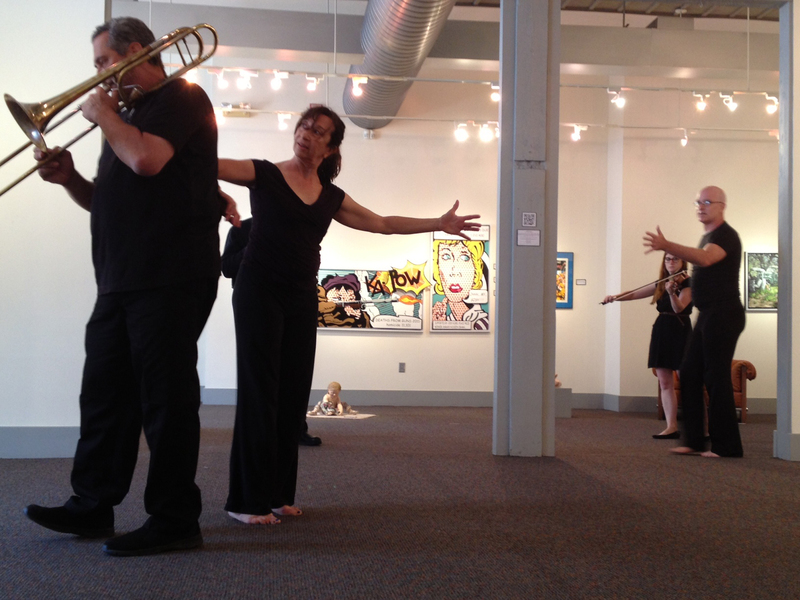 On Sunday, June 30th dancers and musicians performed an improvisational score at Spiva Center for the Arts as the final event in the exhibit ArtWorkers: Creativity and America, which closes Sunday, July 7th. Dancers Susan Rieger and David Ollington and musicians Tom Polett, Ray Castrey, and Marcy Kamler presented “The Well” for a captivated audience. “The Well”, an improvisational score created by Pauline Oliveros in 1962, provides a loose framework for performers to create and interpret based on a five-point star formation. Musicians begin by using the same pitch, and the entire ensemble interacts as performers shift between the points of Listen, Merge, Match, Support, and Soar. Confused? Don’t be. No two interpretations of “The Well” will ever be identical. Ensembles can include as few as four or as many as fourteen performers and musical instruments vary. Musical instruments in this performance included a trombone, violin, melodica, and mouth harp. In Sunday’s performance, the dancers inspired the musicians, and the musicians inspired the dancers. 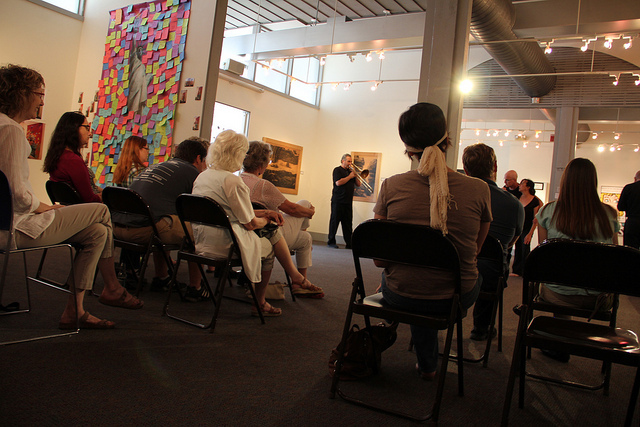 In a Q&A session, the performers also spoke about finding inspiration to interpret from the art hanging on the walls in the gallery. 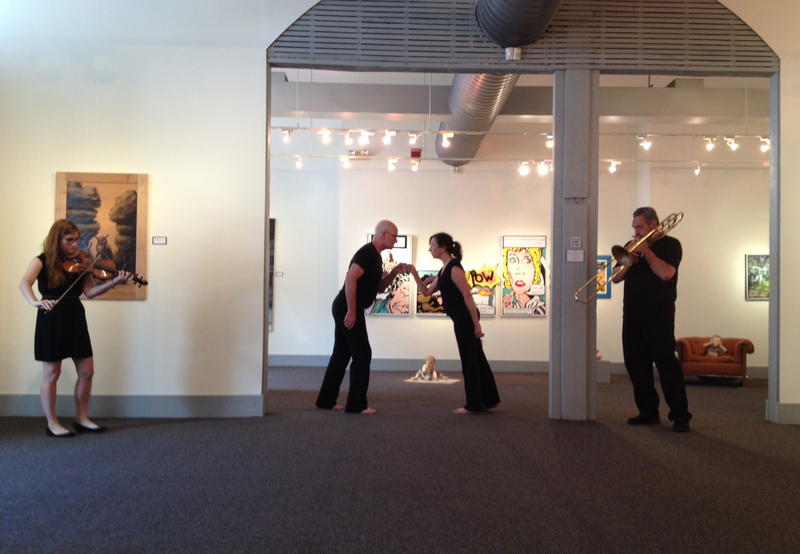 Dancers and musicians moved around the room, interacting with one another and their surroundings. They covered the span of Listen, Merge, Match, Support, and Soar, sometimes performing in corners or behind walls away from the audience, sometimes performing, literally, on top of one another. At one point during the performance, one dancer even placed his head in the trombone’s horn. Nothing was off limits. True to art, contemporary music and dance is a vast venue for exploring the human experience. As the performers interpreted “The Well”, they also interpreted a plethora of ideas and emotions relevant to everyday life. Each audience member seemed to take away something different. Contemporary improvisational performance is not so foreign that the audience is left grappling to interpret the meaning themselves. If you have an opportunity to see “The Well” performed in the future, seize it. This was really one of the most artful performances and unique uses of space the Spiva Center for the Arts has witnessed.